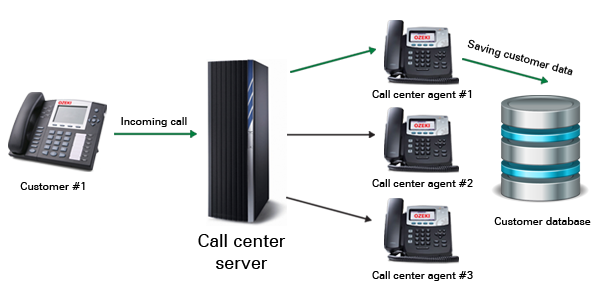 This article is a brief introduction about logging of call information in call centers in relation with Ozeki VoIP SIP SDK. After reading through this page you will be fully familiar with all the essential terms concerning call information logging and what you will need for creating your own solution using Ozeki VoIP SIP SDK. When using a database, you need to put new customer data into the tables, not only receiving them from the database. The information you store in the database depends on the business logic and the actual purpose of the program you make. In case of a call center, you may want to log the information on the caller customers, some authentication data or the problems that they called you with. In this case the database will store all the customer history and you can check it any time for information or even for statistical purposes. The table structure of the database should be well designed before you start the call center implementation. The call center server need to be store all the information into the database, therefore it need to have a database handler part or interface. The data logging can be done automatically in a call center, that is suggested, or you can log some of the data automatically, while the others can be optional to store. In this second case you have to implement the possibility to initiate the storing process within the server or the clients, where the call center agents can log the information into the database in certain situations. When a call with a customer is in process the example program you can get from this site displays all the customer data from a local database onto a customer data form shown in Figure 2. On this data form, you can record notes about the actual call or the customer and by pressing the Save&Close button you can store the new notes into the database. This article introduced you the basic knowledge about logging call information into database in call center solutions and showed how Ozeki VoIP SIP SDK can help you to fulfill your wishes about this topic. If you have read through this page carefully, you already have all the knowledge you need to start on your own solution.